Rabbit meat along with other animal flesh was avoided before the Meiji period in Japan. However, shortly after the introduction of French cooking it went mainstream. 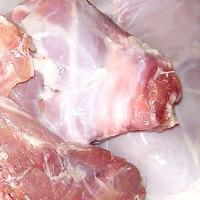 In terms of taste, it is said to resemble that of chicken. It serves as a low fat source of protein high in potassium and B vitamins. The calories in Rabbit Meat per 100g(1cut ) is 146 calories. Rabbit Meat is calculated to be 146Cal per 100 grams making 80Cal equivalent to 54.79g with 20.5g of mostly protein、6.3g of fat、0g of carbohydrates in 100g while being rich in vitamins and minerals such as Vitamin B12 and Niacin.